Some future brides don’t find hiring a DJ an essential part of their wedding day, but depending on what kind of wedding you’re planning – having the extra help might come in handy. Plus, because your wedding is one of the biggest events of your life, you might find that as you get closer to your big day, your mind might change. How do you know you need a wedding DJ? Where do you find one? What does a DJ cost? Read on: we’ll help you sort it all out. 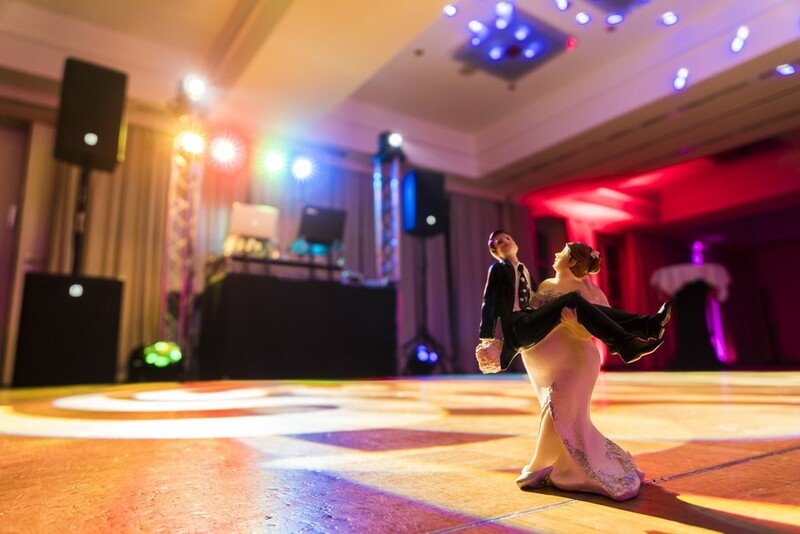 “When you use a wedding DJ you can feel assured that you will have the songs that you picked played at the correct time,” said wedding planner Stacie Baines. Where can you find a wedding DJ? Nowadays, you can Google just about anything, but one of the tricks to DJ hunting is making sure they’re a member of the ADJA (American Disk Jockey Association) and attend conferences to continue improving their skill. Most professional DJ’s have heavy (and expensive) lighting and sound equipment, so some venues will require that they have insurance to cover them and their guests in case something goes wrong. The ADJA actually has a tool to help you find your DJ by specialty and location. This is super helpful when you don’t know where to start searching. DJ tip for the wise: Before booking your DJ, make sure to have a sit-down meeting with them and feel them out. You want to make sure you feel completely comfortable with them before purchasing their services. According to ADJA.com, “Rates for the DJ industry vary greatly, ranging from $350.00 to over $5,000.00 with an average of $1,200.00 for a 4-hour booking. The best price is not always the best deal, especially if you are planning a wedding. As a matter of fact, surveys conclude that nearly 100% of brides would have spent more money on their entertainment and made it their #1 priority in hindsight.” And mssoundworks.com tells us that most professional trained full-time DJs charge $1,000 – $2,500. Keep these prices in mind if finding a wedding DJ for your big day is a priority so you can plan and budget accordingly. If you’re a 2018-2019 bride-to-be and you need a little help calculating the cost of your wedding, TheKnot.com has a fantastic wedding budget calculator to help. When she’s not blogging about financial matters for LendingPoint, Brianna Shelko can often be found on weekends working as a certified DJ herself.